U.S. president Barack Obama will visit Vietnam in May during a trip to Asia, the White House said Monday. Obama will make the trip while in the region for the Group of Seven (G7) summit in Japan. If he ends up making the trip, he will be the third consecutive U.S. president to visit Vietnam in the post-Vietnam war era, following Bill Clinton in 2000 and George W. Bush in 2006. The White House made the announcement after Obama met with Vietnamese prime minister Nguyen Tan Dung on the sidelines of the U.S.-ASEAN summit at the Sunnylands retreat with Southeast Asian leaders (See: “Why the US-ASEAN Sunnylands Summit Matters”). According to a White House official, the leaders discussed the continued strengthening of U.S.-Vietnam relations in 2015, which had marked the 20th anniversary of the restoration of diplomatic relations. “The leaders noted the importance of the Trans-Pacific Partnership, maritime security, and human rights to advancing bilateral relations,” the official said. Vietnam is one of 12 members of the U.S.-led TPP and is also a claimant in the South China Sea disputes. U.S. officials had indicated that both issues would be discussed at the U.S.-ASEAN summit in Sunnylands (See: “US-ASEAN Sunnylands Summit: What to Expect”). Obama was initially expected to make a trip to Vietnam last year in line with the 20th anniversary. 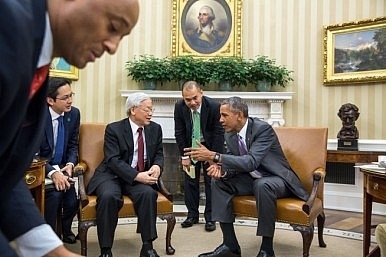 He had received an invitation to visit the Southeast Asian state when the general secretary of Vietnam’s Communist Party Nguyen Phu Trong visited the White House for the first time last July (See: “US and Vietnam Should Boost Defense, Economic Ties, Says Communist Party Leader”). In addition to his Asia trip in May, Obama is also expected to visit the region in September for this year’s round of annual Asian summitry, which will take place in Laos, the ASEAN chair for 2016. In doing so, Obama will be the first U.S. president to visit the landlocked Southeast Asian state.